The course is fast but accessible for all skill levels. A perennial favourite in the Phat Kidz series. If you’re anywhere near Whistler at the end of July, consider checking out Whistler’s newest grom race format: Phast Kidz. 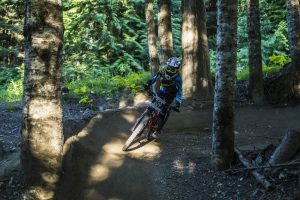 It’s held on a weekend, allowing non-local groms a chance to compete in a professionally run Downhill bike race without taking an afternoon off work/school to race up the sea to sky (which isn’t uncommon). It aims to be a very official-feeling full day event, with professional level timing, closed course practice laps, specific start orders, and all the same things that would It gives the young racers a chance to get the sense of what racing in a competitive race series is like. The Whistler race crew recognized that while many grom racers are fast enough to compete in the regionally, or even nationally (seriously, these kids are good), they’re not yet old enough to enter the larger races, so Phast Kidz is filling in the gap. This ensures that everyone can race and have a blast doing so. So if you you think your grom might like to get a taste of DH racing in the world’s best bike park, or if they’re looking for another podium while they wait to hit the minimum age requirements for their regional series, mark your calendar for July 29th.